San Juan, Puerto Rico, August 18, 1939. Apologies for not having written you heretofore particularly from the viewpoint of congratulating you and the War Department upon your designation as Deputy Chief of Staff. The major problems of the service cannot be in better hands, and I hope one of them, i.e., re-vitalization, will have been consummated before your term of office expires. This morning I was informed officially of my promotion to the grade of Colonel, effective August 15th. Immediately upon notification I proceeded home and had Lucile redecorate my shoulders with the old Shanghai eagles that you so kindly presented to me [with] at a never to be forgotten party in Washington. The War Department timed my promotion most effectively, since I succeeded to command of the 65th yesterday upon the departure [unreadable] of my predecessor, Colonel Wight, for the states. On Wednesday after the final parade for Colonel Wright, General Daley remarked to the effect that it would be mighty fine to culminate the numerous social and official activities of the day by my being promoted. Whereupon, we proceeded to the club, where I was informed of the commissioning of the Air Corps officers with the natural deduction of my promotion as a result thereof. This of course, was the occasion for another party in addition to the many despedidas being given for the Wright’s. The 65th Infantry is a grand regiment and with reluctance I shall have to change my first love from the old 31st to this regiment. General Daley is a perfect Department Commander and my relations with him have accordingly been most satisfactory and pleasant. 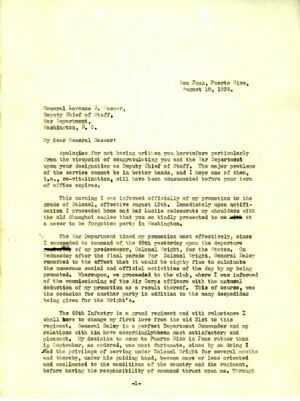 My decision to come to Puerto Rico in June rather than in September, as ordered, was most fortunate, since by so doing I had the privilege of serving under Colonel Wright for several months and thereby, under his guiding hand, became more or less oriented and acclimated to the conditions of the country and the regiment, before having the responsibility of command thrust upon me. Through Colonel Wright's efforts a tremendous amount of constructive work has been accomplished here for the Government in general and the War Department in particular. Since he had many of those precious qualities possessed by you, he naturally was a very popular C. O., both with the citizens and the troops. Lucile arrived on Monday after a very quiet voyage and has been since indulging in many social and house settling activities. It is mighty nice to have her here after two months of bachelorhood with nobody in Ponce de Leon's mistress's old home, “Casa Rosa”, to communicate with except the mistress's ghost which was most unsatisfactory. This home is delightful and Lucile is very much pleased with it. I was so happy that she was able to see you and Miss Molly immediately before her departure, since by so doing she was provided with a great thrill and I was able to obtain some current information of your health and activities. You will perhaps be too over occupied during your remaining active service to pay us a visit but I do insist that you take the first boat after the beginning of your terminal leave or retirement, for Puerto Rico and thereby give us and all your many friends here the benefit of your presence as our guest. Lucile joins me in lots of love to Miss Molly, yourself and all our mutual friends. Hartle thanks Gasser for recognizing his promotion to Colonel. Hartle's feelings about his new command are expressed.